Unakoti - 178 k.m. from Agartala, in Tripura, India, is a place of marvelous rock carvings and stone images. It is the main tourist spot of North Tripura District at Kailashahar Subdivision. Unakoti is famous for the rock-cut images, murals with their primitive beauty, forest with green vegetation and waterfalls all around. Unakoti literally translates into 'one less than a crore'. It is popularly believed that the place has over 10 million rock cut carvings. According to mythology 'Lord Shiva' was on a voyage to Kashi (a holy city in India) along with one crore gods and goddesses. He made a night halt at this location. He asked all the gods and goddesses to wake up before sun rise and proceed for Kashi. Next morning, except Shiva no one else woke up. Furious over their negligence, Shiva set out for Kashi on his own, cursing the others to become stone images. 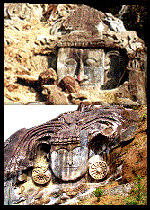 Looks like an open air art gallery, the images found at Unakoti are of two types - rock-carved figures and stone images. These images belong to 11 A.D. to 12 A.D. Among the rock-cut carvings, the head of Shiva and gigantic Ganesha figure are the most popular ones. The head of Shiva is also known as ‘Unakotiswara Kal Bhairava’ and it is about 30 feet high including an embroidered head-dress which itself is 10 feet high. Three enormous images of 'Nandi Bull' are also found half buried in the ground. There are various other stone as well as rock cut images at Unakoti. 'Unakoti Astami Kunda' is another sacred place for pilgrims. Every year at Unakoti, a big fair known as ‘Ashokastami Mela’ is held in the month of April which is visited by thousands of pilgrims. Unakoti is the most sacred place to observe Ashokashtami, Makar Sankranti, and Maha Shivaratri.